Whilst researching stories of Sir William Paxton (1743-1824) as background for leading tours of his estate at the National Botanic Garden of Wales I came across a puzzling reference stating that he purchased the Inn at Cold Blow. I knew Cold Blow as a remote cluster of a few houses lying on a hill to the south of Narberth. What could have driven him to purchase its inn? The answer, I eventually found, lay in the fact that it was on a Turnpike Road. An Act of 7 March 1763 established the Main Trust, the first of the Turnpikes in South Wales, through Carmarthenshire from Trecastle mountain west to Tavernspite on the Pembrokeshire border. [i] Tolls (fig.1) were extracted to repay the upkeep of the road, which simply followed the long-used byways uphill and down dale. Soon many more Turnpikes were to follow, including the Tavernspite Trust in 1771. The road led from Tavernspite through Princes Gate, Cold Blow and Narberth Bridge through the town to Robeston Wathen and on to Haverfordwest (fig. 2). At the start of the nineteenth century travel to the Continent was hindered by Napoleon’s antics. Instead society looked to places in the U.K., especially to sea-bathing and spas then in fashion and William Paxton saw his opportunity to capitalise on that – by developing Tenby, which had by then become very run-down, with many neglected houses. The many developments in Tenby that Paxton made relied upon a tourist trade, so access to the town was critical to its success. For the very wealthy with their own coach travel that was less of a problem. The upper middle class could travel there individually by horse. But for many travel was by coach, including the mail coach with its four outside seats. The nearest mail coach route was that which went through Narberth where the Receiving House transferred the packages of mail destined for Tenby residents onto saddle horse for delivery there by the postboy. [iii] If Paxton could connect Tenby by coach to the mail route it would enable passengers to transfer from mail coach to the local taxi route. But that journey from Narberth to Tenby entailed crossing Narberth ‘mountain’, a steep climb for coach-horses. 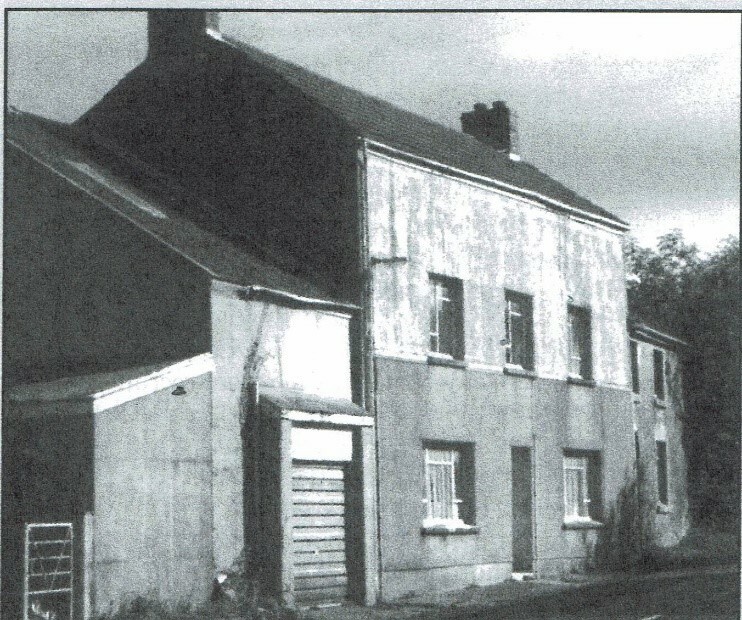 An early staging post on the mail route had been the Noah’s Ark Inn at Blaengwaethno near Princes Gate[iv], nine miles from St Clears, but that had closed by 1810 when Richard Fenton made his travels. Fenton refered to Narberth town as a ‘market and post-town.’[v] So a staging post was located there, probably in the White Hart Inn, which had existed since at least 1776[vi], but that was twelve miles from St Clears , half as far again as the ideal distance of seven to eight miles. Tavernspite had inns – the Old Tavernspite (later renamed the Coach and Horses) and the Plume of Feathers[vii] and the latter was certainly a Milford mail staging post in 1810, according to Fenton. 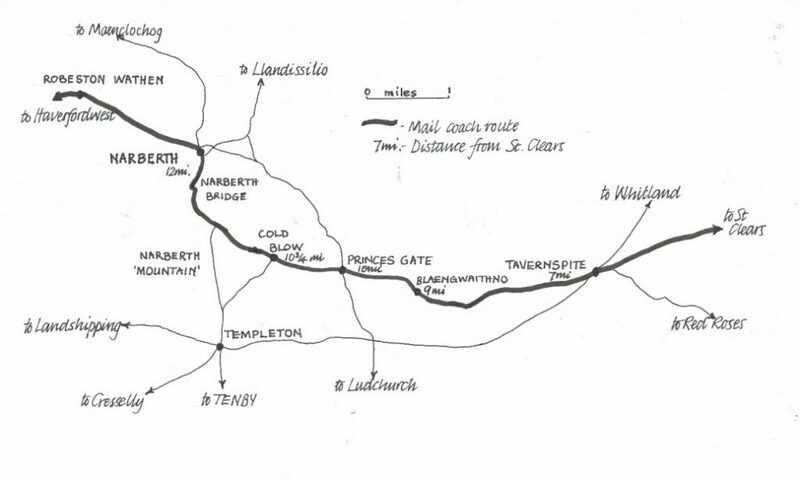 [viii] That was 7 miles on from St Clears, so the next stage, to Narberth, would have been a short 5 miles. Paxton would have been able to see that Cold Blow offered advantages as a transfer point. It lay on the main mail route at a junction which led to Tenby, avoiding Narberth Mountain, and at just over 10 miles from St Clears made a slightly less demanding journey than going on to Narberth. A staging post there could possibly replace both Tavernspite and Narberth. Did he gamble on that? We may never know. One account states that he built an inn at Cold Blow [ix] and that seems confirmed in the wording – ‘has been built’ – of a later letter from the District Surveyor in 1814 referring to the inn there (see below). In June 1812 David Hughes advertised (fig. 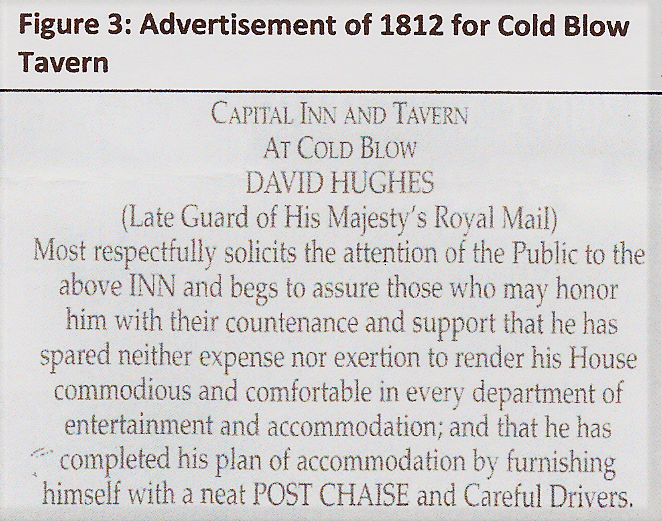 3) the inn at Cold Blow as having a Post Chaise and ‘careful drivers’. ‘since Tenby has become a fashionable resort for sea-bathing, and the number of visitors much increased, a very good inn has been built at a place called Cold Blow, which is a more convenient point of communication, both with Tenby and Pembroke as by that means a long steep hill called Narberth Mountain is avoided … I therefore propose that a Receiving House …shall be fixed at the Inn called the Windsor Castle in Cold Blow …(at) a small salary per annum of £4’. The PMG, Sir Francis Freeling, confirmed the transfer in June, 1814. [i] What the residents of Narberth felt about this switch is not known. Their mail was now carried on foot. Figure 4: Cover sheet of letter sent from Cold Blow by J. Hensleigh Allen, M.P. In or around 1824, the year that William Paxton died, the Receiving House gained a circular 254 mileage mark. [iv] The cover sheet (fig. 4) was sent by John Hensleigh Allen, M.P. 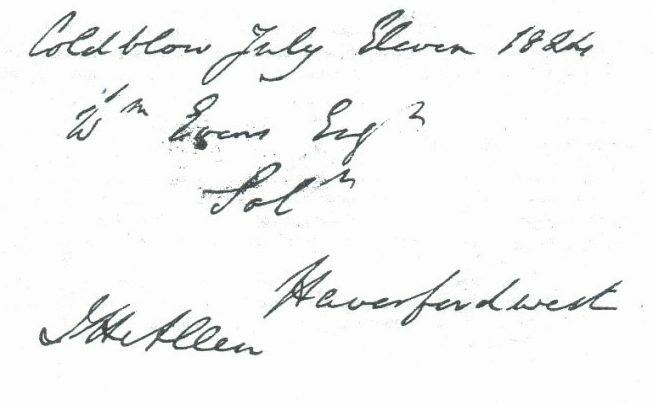 for Pembroke Borough, via Cold Blow, to his solicitor in Haverfordwest, probably near the peak of its business life. In the following year William Small was thrown from his horse and he died, leaving his wife, Mary, to run the business. But the Receiving House was transferred to Narberth in 1827 and stayed there until 1836 when it was proposed to return it to Cold Blow. Still in the hands of Mary until March, 1837 she auctioned off the fixtures and fittings, a process lasting two days, and retired to a cottage next to the inn. She sold the inn five years later as well suited ‘ for being converted into an excellent premises for maltsters’. At that time the end was clearly in sight for the inn. A new road was being built by Thomas Telford from Red Roses through to Hobbs Point, Pembroke Dock. That was opened in April, 1839 and became the new mail coach route for Ireland, but for little more than a decade, because then the railway took over. Figure 5: The Windsor Castle, after its demise as an inn. Carmarthenshire Historian IV (1967), 41-54.
newsletter No. 50 (December, 1988), 4-11. Newsletter (September 1990), 55, 10-11. NLW David Williams collection 1802 Letter from Wm Paxton to David Williams. B. Price, The Fortune of William Paxton in Pembrokeshire Life (November, 2011), 9-11. (British Library, India Office Collection). R. Fenton, op cit (1903), 168. K. Johnson, op cit, 115. Pembrokeshire Life. (November 2002), 7. R. Fenton, op cit, 261. K. Johnson, op cit , 64. D. Rhys-Phillips, and H.B.Lee, The Postal History of Tenby (1974) 5. Anon, The Charm Doctor (1857), 222. Anon – (?G. Scourfield) mimeo notes ‘Narberth Post Office’ held in Narberth Museum. D. Rhys-Phillips & H. B. Lee, op cit. [i] D. Rhys-Phillips, and H.B.Lee, The Postal History of Tenby (1974) 5. [ii] K. Johnson, op cit. [iii] Anon, The Charm Doctor (1857), 222. [iv] D. Rhys-Phillips, op cit. [ii] Kuiters Op cit, 40/41. [v] R. Fenton, op cit (1903), 168. [vi] K. Johnson, op cit, 115. [viii] R. Fenton, op cit, 261. [ix] K. Johnson, op cit , 64. [iii] The London Gazette 6.4.1793. [vi] NLW David Williams collection 1802 Letter from Wm Paxton to David Williams. [vii] B. Price, The Fortune of William Paxton in Pembrokeshire Life (November, 2011), 9-11.